Renewing our Energy | UC Berkeley Student Affairs Community Blog! How many times have you felt exhausted, just in the past week? Worked through lunch? Read so many emails and multitasked that you lost your train of thought? In order to push through, did you continue to work? Perhaps grab a cup of coffee at Cafe Milano? Stopped by Sheng Kee to get a pastry? Spiritual Purpose: serving something larger than ourselves. In order to be at our best, the Energy Project explains that when we expend energy, we must also renew our core energy needs. As humans, we are not built to be robots or computers. 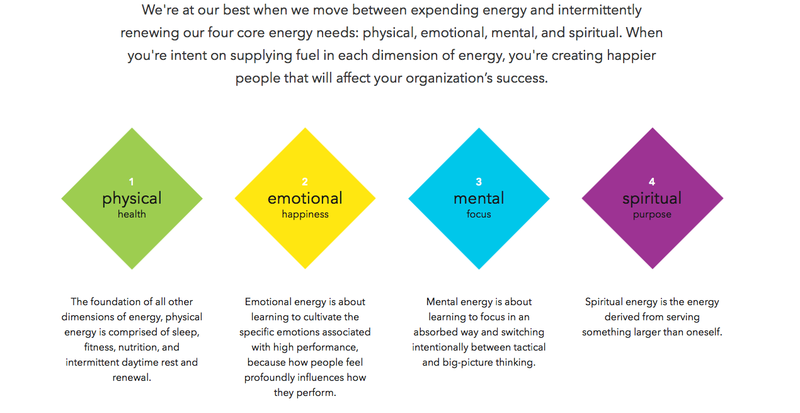 Sounds simple, though we challenge you to think about how you are renewing yourself in these four core areas. Think about it: if our energy is depleted and we continually push ourselves to the point of exhaustion, how are we showing up for our students and for one another as colleagues? Let’s start creating a culture where we intentionally refuel our core energy needs and be an example to those around us. Challenge of the Week: commit to renewing at least one of your core energy needs in the week ahead. Bonus Challenge: reflect and discuss with a colleague of how that has changed how you show up at work!